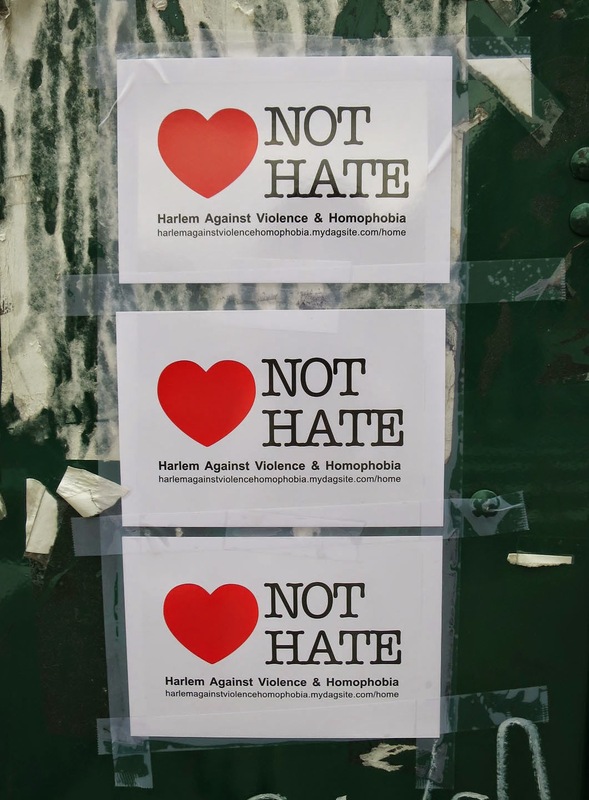 I noticed these stickers as I strolled back home, up Lenox Avenue on Saturday. The trees are beginning to leaf out, the avenue was packed with well dressed Harlemites (people dress, here - I have never seen as many hats and waistcoats and polished shoes). And some little stickers fought back against a big sign. 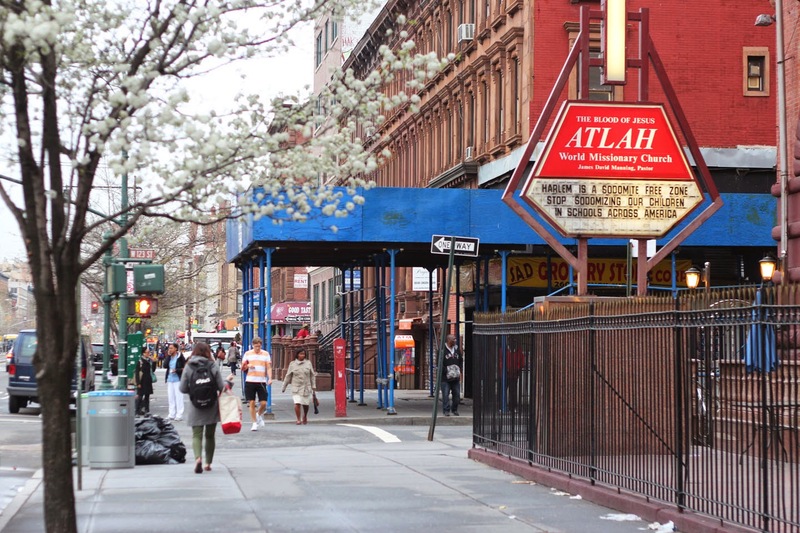 In the latest news about the church of Atlah's homophobic rants (recently refreshed for spring), there will be a benefit night on May 20th to raise funds for Harlem's Ali Forney Center. In reaction to the extraordinarily ignorant message that this church sign shares with the passing world, $5,500 has been raised for the center in the last few weeks, and the special night on the 20th will be a big boost to the organization that supports runaway and homeless youth in the community. Author Stacy Parker Le Melle, of Harlem4Kids, an influential community forum, is the event coordinator. To support their efforts you may buy a ticket to attend the evening and panel discussion (held at the wonderful little Maysles Cinema around the corner from us). You may also donate raffle items or support without attending. Because it is your neighborhood and you (of course) care about making it a hate-free zone, I intend to immediately send a "remote" donation the Ali Forney Center. It is encouraging that down here in coastal Virginia wherein all races and religious groups are loosely thrown together in a lightly populated setting, there is little-to-no discernible tension of any kind, and to illustrate that point, a nearby black church of considerable endowment has opened its doors to a white church that lost its home. And although the services have been heretofore separate, they recently joined together in a ceremony conducted by both pastors. We wish them success in their efforts to facilitate common togetherness and cordiality... And, to reject whatever hate that might linger beneath the surface on both sides. I am so glad to read that people are "fighting back" against this horrific bigotry and hatred in such a positive way.